"This was what the Pennsylvania Germans called 'wilted salad'. It was one of the first recipes I was taught to make. When the dressing is warm, I pour it over the greens and set it aside while I prepare the rest of the meal. The heat wilts the greens, which are still slightly warm when served. -Patty Kile, Greentown, Pennsylvania"
In a skillet, cook bacon until crisp. Remove bacon to paper towels. Drain, reserving 1 tablespoon drippings. Stir flour into drippings until smooth. In a large bowl, beat egg; add water, vinegar, sugar, salt and pepper. Slowly pour into skillet. Bring to a boil; boil for 2 minutes, stirring constantly. Place spinach in a bowl. Remove dressing from the heat; stir in reserved bacon. 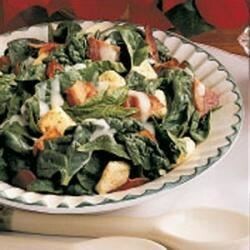 Immediately spoon desired amount over spinach; add croutons and toss to coat. Serve warm. Store leftover dressing in the refrigerator for up to 2 days. Before serving, reheat over low heat just until heated through. The dressing thickens when you add the flour/bacon mixture and the egg mixture. Also, when you heat the dressing it cooks the egg. Very tasty and satisfying! A salad that eats like a meal. Great taste if consumed immediately but I found it doesn't store well. Make just enough for your salad and it will taste great. Maybe 1/2 the flour? this turned out to be a good salad for my get together.